Harness has 2 pair of Speaker inputs, and power wires for Battery and Ground, Amp remote turn on. This list is of known units this harness will work with. So be sure to try part to see if fits1st. If you need to know if a harness fits a certain unit not listed. Up for sale is 1 used, ALPINESub woofer harness for units listed below. /////ALPINE PWE-N80 Power Harness. Alpine PWE-V80. 10 pin power harness with about 18" positive Power wire, 18" Remote turn on wire, 1 ft Power Ground wire. Harness only. not always free to these locations. You will get what is shown on the pictures. No original box or any other accessories. It will fit many models which I will list below. You Won’t Get a Knockoff that Looks Like an OEM ! ALL Photos are Actual unless specified ! 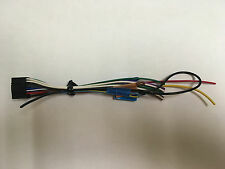 8-pin Speaker High level input plug harness sony AMP. Size: PLUG IS ABOUT 5/8" WIDE AND ABOUT 3/4" LONG, WIRES ARE 5 1/2" long. ITEM UP FOR BID IS A NEW/UNUSED KENWOOD RCA OUTPUT HARNESS CONSISTED OF FRONT/REAR/SUB AND CENTER CHANNEL OUTPUTS. 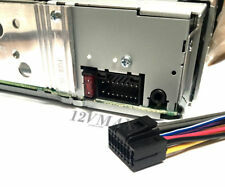 THE HARNESS IS CONSISTED OF A 14 PIN PLUG, IT'S FOR SELECTED DNX/DNN 7/8 SERIES UNITS. THE LAST UNITS WITH THE CENTER CHANNEL ABILITY WERE IN 2011. IF THERE IS ANY QUESTIONS PLEASE MESSAGE ME. Alpine 3527. Alpine 3 pin power harness. Harness has power wires for Battery and Ground, Remote turn on and left and right speaker output. and front and rear 4 pin Speaker output harnesses. 2 4 Pin harness for front and rear output Approx 5 1/2" long. Alpine PKGRSE2. Alpine 4 pin power and Door Trigger harness. Alpine PKGRSE3. Harness has power wires for Battery and Ground, ACC and Door Trigger. 1 4 Pin power harness approx 18" long. This list is of known units this harness will work with. 5-pin Speaker High level input plug harness bazooka cadence boss AMP. Size: PLUG IS ABOUT 1/2" WIDE, WIRES ARE 5 1/2" long. MTX Thunderform 3 pin power Harness. Harness has power wires for Battery and Ground, Amp remote turn on. This list is of known units this harness will work with. So be sure to try part to see if fits1st. Clarion 4 pin power. Clarion SRV 250. Clarion SRV 202. Harness has power wires for Battery and Ground, Amp remote turn on. This list is of known units this harness will work with. So be sure to try part to see if fits1st. Size: PLUG IS ABOUT 5/16" SQUARE AND ABOUT 3/4" LONG, WIRES ARE 1 ft long. Kenwood Car Stereo Power & Speaker Harness. 16 pin wire harness (Fully Pinned). Car Head-unit cable Adapter. Models up to year 2016. T he E lectronics G uru. international orders. New 8 pin Harness. A wiring diagram will also be sent with harness. JX250 JX360 JX400 JX500 JX1000. 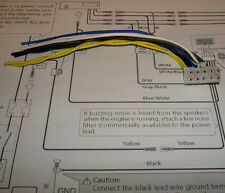 5-pin Speaker High level input plug harness JL audio AMP. Size: PLUG IS ABOUT 1/2" WIDE, WIRES ARE 5 1/2" long. New 8 pin Harness. A wiring diagram will also be sent with harness. For unit listed in Title. New 8 pin Harness. A wiring diagram will also be sent with harness. This is the power plug for the Monitor. For Models: KDCBT562U KDCBT565U KDCBT762HD KDCX500 KDCX599 KDCX700 KDCX799. THis Is The Complete Harness To Wire The Unit Into The Vehicle. JDI ORIGINAL OEM 2-WAY MICROPHONE FOR KENWOOD RADIOS. PLUGS DIRECTLY TO KENWOOD 2-WAY RADIOS OR. 2 PIN CONNECTOR PLUG. LI STING IS FOR ONE ITEM PER SALE. JDI ORIGINAL SPEAKER MICROPHONE FOR KENWOOD 2-WAY RADIOS. PLUGS DIRECTLY TO COMPATIBLE 2-WAY RADIOS OR. LI STING IS FOR ONE ITEM PER SALE. 4FT CORD - PUSH-TO-TALK. This is a universal plug and will work on many different model TV's from kenwood. be for you buy this plug, be sure to look closely at your radios plug hole and my pictures to see if this plug will fit your radio. Up for sale is a new kenwood ktx-h300 13 pin to 9 pin conversion cable. KENWOOD WIRE HARNESS DC CORD KE30-6428-05. USE: Plugs into factory harness. Needed to install upgraded stereo. Be for you buy this plug, be sure to look closely at your radios plug hole and my pictures to see if this plug will fit your radio. if it fits and you radio works the plug will work. PLUG COLOR - BLACK. 4-pin Speaker High level input plug harness Pioneer AMP. Size: PLUG IS ABOUT 7/16" WIDE AND ABOUT 3/16" tall, WIRES ARE 5 1/2" long. 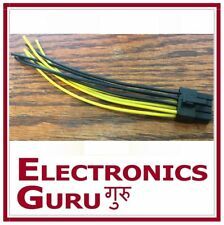 Compatible with Kenwood 10x Wiring Harness. Give us a chance fix the problem. DO NOT REMOVE SECURITY LABEL, it will void the warranty. We keep records of Serial Numbers for all units we sold.